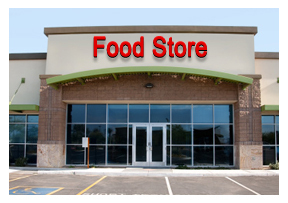 Food stores can range from small convenience stores such as a 7-Eleven, to large supermarkets. They also include specialty stores such as bakeries, grocery stores, meat & fish markets, health, and ethnic food stores. In addition, there are new, competitive trends in progressive food stores that repackage concepts for maximum customer convenience, including offering prepared foods that are ready to heat-and-eat. Most food store energy costs are very high due to the necessary refrigeration of many food items. Food storage cooling and refrigeration is usually the single largest element, since refrigerated display cases operate 24-hours a day. Air conditioning is required for both customer comfort and proper operation of the refrigerated display cases. Data for calculating loads for people, lights, motors, and other energy-consuming equipment should be obtained from the store personnel, equipment manufacturers, and the ASHRAE Handbooks. The major difference in a food store HVAC system, as opposed to other types of stores, are the refrigerated display case loads and their effect on the HVAC system. Existing stores can be retrofitted with a more modern system. Other opportunities include: upgrading old and/or inefficient systems, particularly if CFC refrigerants are used; and implementing any of the above, energy-saving tactics currently not in use. Water heating is not a major energy user in most food stores, with applications typically limited to hand washing and cleaning purposes. Most water heating is done separately from the building heating system and uses direct resistance or gas heaters, and in some cases, point-of-use heaters. If existing systems are inefficient or inadequate, they should be promptly replaced with efficient, modern equipment. Also, you may want to consider adding timer controls or better insulation on storage tanks. In some cases, refrigeration equipment heat reclaim can be used to preheat service hot water. The ASHRAE Applications Handbook chapter on Service Water Heating analyzes typical hot water use data as well as estimating procedures. Some food stores incorporate food preparation and food service functions. This requires the installation of some cooking equipment such as ovens, broilers, fryers, griddles, ranges, steam cookers, and warmers. For more information on that equipment, please refer to the Restaurant section of this library. Food stores may sell perishable foods that require a variety of refrigeration systems to preserve and attractively display the items. The general purpose of a refrigeration system is to cool and store food, thereby extending its shelf life. In addition to refrigerated display cases, there are refrigerated food processing rooms, and walk-in rooms. Cracked and crushed ice is often used to display and requires a specific type of refrigerated display case. Refrigeration is often a significant user of year-round electricity, since this equipment runs even when the building is unoccupied. Therefore, it is usually most cost effective to install the most energy-efficient refrigeration unit that your budget can handle. Consequently, an energy utility's representatives should be asked to work closely with the energy customer during the early planning stages of food store development in order to help the customer best understand their options; and to always be alert to expansion needs and the potential replacement of old, inefficient equipment with new, more efficient units as described above. In the past, refrigerants CFC-12, HCFC-22 and R-502 (an azeotropic mixture of HCFC-22 and CFC-115) were used in food store refrigeration. However, production of CFCs has ceased, and HCFCs are being phased out via a production freeze and have not been used in new equipment since 2010; production will cease altogether in 2020. One current replacement for R-22 and R-502 in low and medium temperature refrigeration applications is R-507 (an azeotropic mixture of HFC-125 and HFC-143a). As new refrigerants are developed, please work with the food stores to phase in replacements and and encourage implementation of the other steps we have discussed in order to optimize energy performance.